Several sources of this quotation cite it as originating in an autobiographical book by Leopold Infeld, who introduces the quote as “one of Einstein's beautiful phrasings.”1 Infeld was assistant to, and then a scientific collaborator with Albert Einstein (at the Institute for Advanced Study, Princeton, New Jersey), so he is presumably able to provide such a quote from first-hand experience. One of the problems on which they worked together was Einstein's theory of general relativity. They sought to reconcile equations of the gravitational field with equations of motion. (What does that all mean? Don't ask. Just know there are elusive, complex calculations involved.) At the same time, they wanted “to pay any price in computation to obtain a theory which is cleaner and purer from the logical point of view. Part of the complexity of the equations involved finding solutions to partial differential equations, and to compare those mathematical results with what can be physically observed. 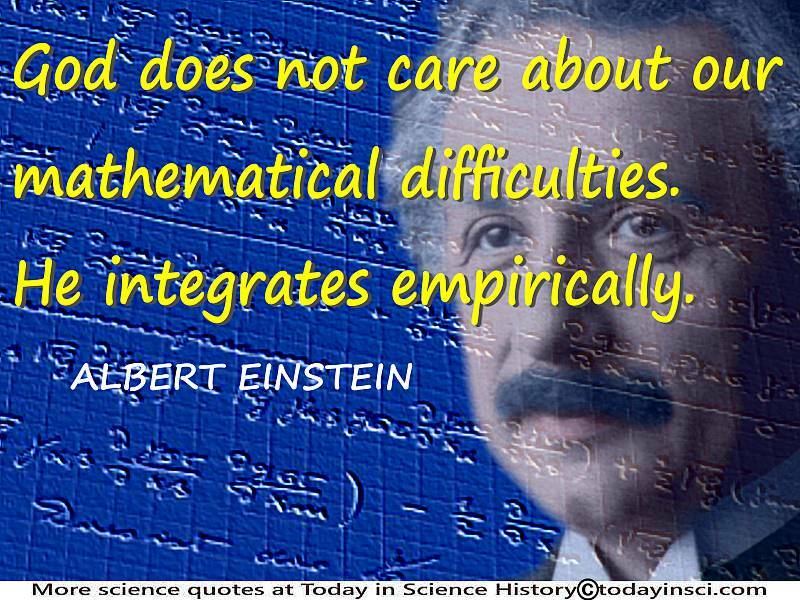 The mathematical technique that must be applied is called “integration.” An empirical approach begins with evidence derived from observable experience rather than logic from first principles. Thus, your Webmaster interprets Einstein's remark to mean that “Nature does its own thing, needing no mathematical blueprints, but whatever is, that's just the way it is, and Nature continues to proceed that way.” Scientists want to make a mathematical blueprint that predicts that behaviour, because then that can be used to provide more insight to related phenomena. Thus, any child knows that to stand, holding a heavy rock over its foot and let go, results very promptly in a painful foot. Nature releases (what scientists call) the energy in the gravitational field, and turns it into motion as the rock and the Earth gravitationally attract each other. Which turns out badly for the foot, when all that energy is released by the rock when they meet. While the child limps away, the scientist is still trying to figure out HOW does gravity actually DO that? Because the same gravity also influences the motions of the stars and planets, at vast distances apart. And the frustrated scientist wants to know not just “how,” but also to have the ability to make the kind of predictions with which measurements agree on “how much.” Furthermore, that gravity originates from the assembly of atoms into a mass. How does gravity relate to the laws governing the inside of the atom? 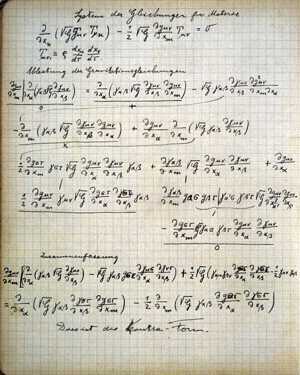 These are the mathematical difficulties that perplexed Einstein. 1 Leopold Infeld, Quest: An Autobiography (1980), 279.